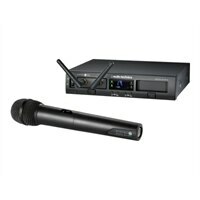 Audio-Technica's System 10 PRO rack-mount digital wireless system provides wireless that's so simple to use, so dependable, and so automatic, you never have to think about it. Set it up anywhere, turn it on and it's good to go. System 10 PRO delivers interference-free operation in the 2.4 GHz range (i.e., outside TV bands) with many features for ultimate versatility. The durable half-rack chassis houses two receiver units that can be operated locally or released from the chassis and mounted remotely (up to 328 feet away) via Ethernet cable.